With eTherapy, you can work through a series of exercises on your computer and learn self-help techniques to help you manage any problems in your life and feel better about yourself. 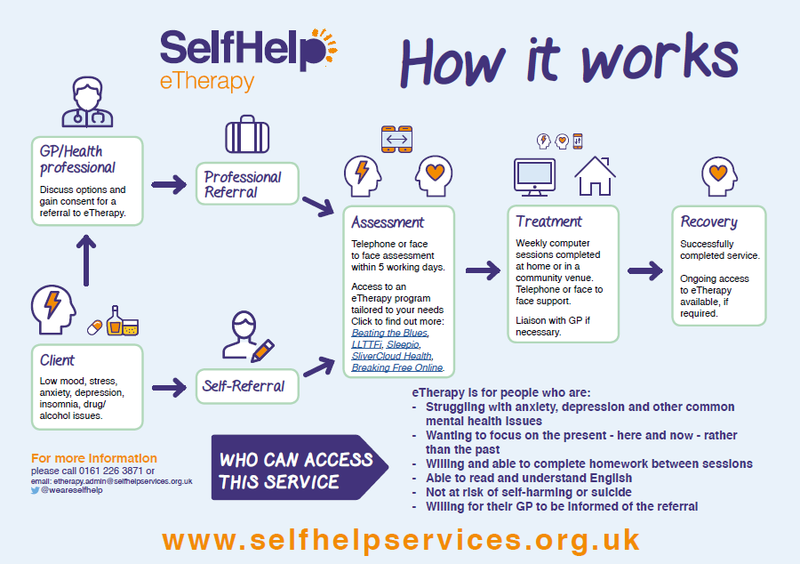 Our trained staff and volunteers are available to provide you with guidance and assistance when you access any of our eTherapy programmes, which include: Living life to the Full, Silvercloud Health,Sleepio,Breaking Free,Hold Your Nerve and Shift Your Stress. Our award-winning service provides therapy online and is proven to help you overcome anxiety, depression and issues related to low mood and stress. “It was really easy to get referred and was seen quickly. The setup of the programme was brilliant that I was able to access it at any point throughout the therapy and it was better than I thought it would be. Also impressed that I am able to continue to access it for another year.